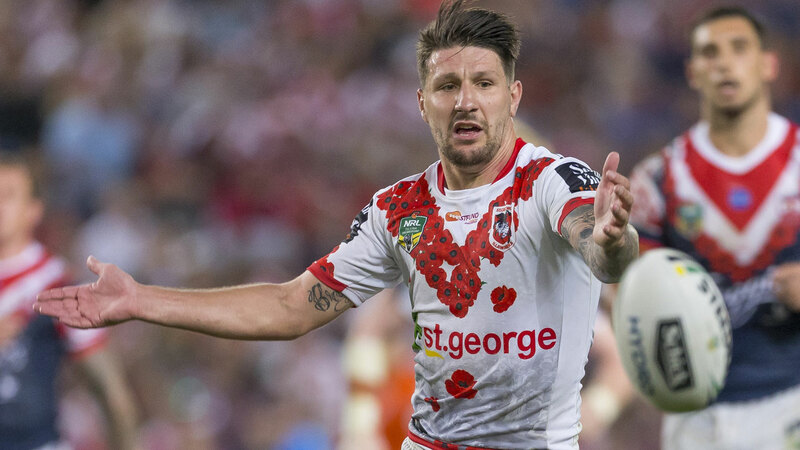 English star Gareth Widdop has stunned the Dragons by requesting an immediate release from the final three years of his NRL contract, Fairfax Media reports. The Sydney Morning Herald reported that Widdop is homesick and wants to be freed from his $1 million per season deal in order to return to England. Super League clubs, including Huddersfield, are already circling. Yet the Dragons are set to deny Widdop's request due to his importance to the club, and the limited options they would have to replace him for 2019 given the timing of his request, the Herald reports. The sudden availability of Shaun Johnson, who has demanded a release from the Warriors, may provide a solution that allows Widdop to leave - though the Dragons would be competing with local rival the Cronulla Sharks for his signature. Widdop, 29, is just one season into his high-profile halves partnership with fellow $1 million man Ben Hunt. The pair led St George Illawarra to the finals last season. Now, the England Test player's time in the NRL may be drawing to a close. Widdop made his name at Melbourne Storm, before moving to the Dragons to escape the shadow of Cooper Cronk, Cameron Smith and Billy Slater. The playmaker grew up in Yorkshire. There have been rumours for some time about Widdop wanting a return home, but they seemed to have been put to rest when he signed a new four-year deal - worth $4 million - with the Dragons in April last year.